I am an in-ear earphones kind of person. I find them small, portable, with enough noise-cancellation, even if passively, and comfortable to wear for hours and hours without any head pressure or weight. Over the years, I gravitated toward the Sennheiser C and CX series for their tiny earbud size and it became more and more difficult to adapt to larger sets. But I kept wanting and yearning for a nice pair of big cans, maybe because of their popular appeal and visually imposing presence around me, maybe because they felt like they could provide a richer and better sound, maybe because some of them offered active noise cancellation, and maybe it was just the fact that they looked cool. 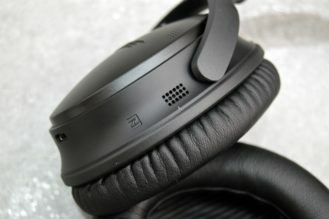 But I couldn't tolerate them, regardless of whether they were on-ear or over-ear headphones. The weight, the bulk, the pressure around the ears and the head, they were all major inconveniences that I couldn't get over. But I didn't give up. I tried pair after pair, brand after brand, but oddly enough, Bose never fell under my hands - or over my head and ears - until now. 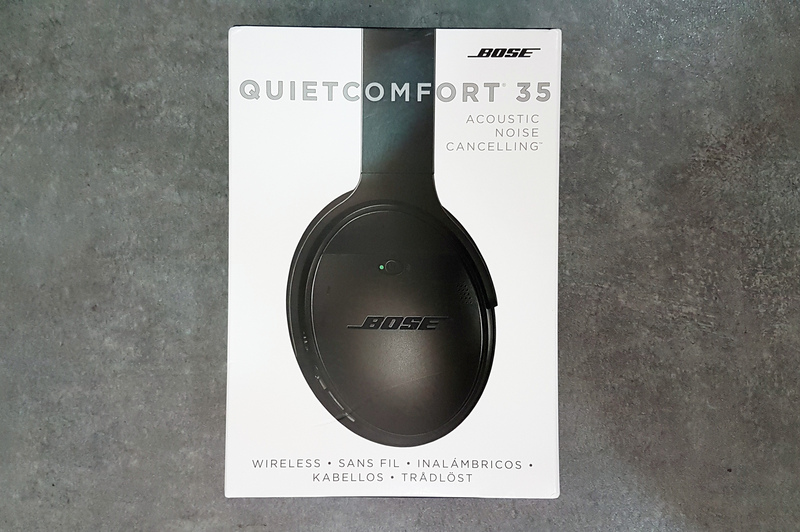 These QuietComfort 35 won me over, not because of their sound, but because they're the only over-ear headphones I can wear for more than 10 minutes without a massive headache building up in my brain and pressure crushing my skull. I consider that a success and, if you're like me, a major one. After all, mindblowing sound quality in a headphone I can't wear for more than 5 minutes is utterly useless compared to very good sound quality in a headphone I can listen to for several hours continuously. But before I get ahead of myself, let's start from the beginning. For a $349 pair of headphones, I have to say that the Bose QC35's packaging left me a little disappointed. 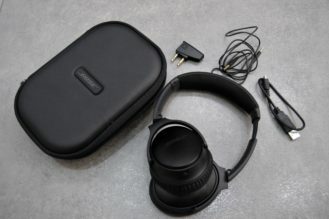 It's functional, but there's none of the imposing wow factor of unboxing something like the Plantronics BackBeat Pro+. You might as well be opening the box of a pair of $50 headphones, you wouldn't know the difference. 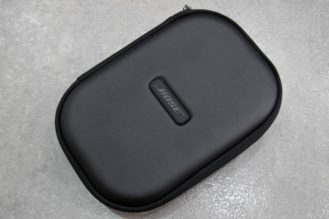 But first impressions don't stick for too long and you're instantly faced with a semi-hard neoprene black case emblazoned with the Bose logo. Inside, you'll find the QC35 tightly wrapped and kept safe through shipping. There's also a MicroUSB charging cable and a 2.5mm to 3.5mm audio cable. The case is actually one of the things I love about the QC35. 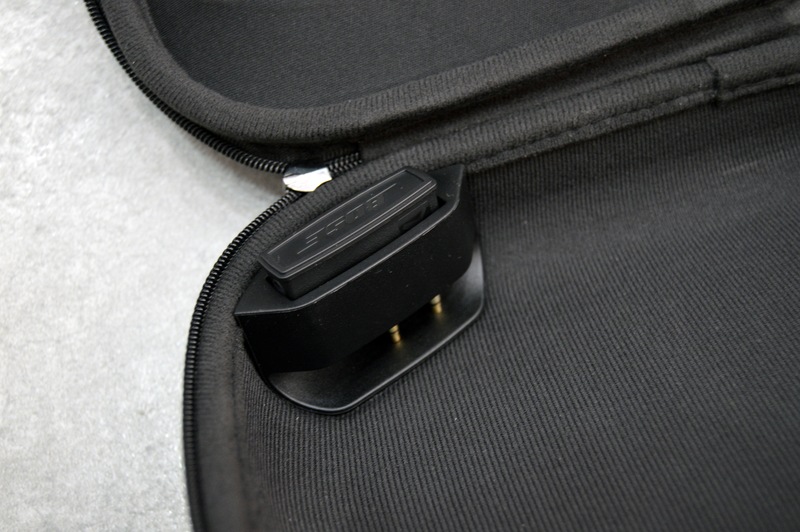 There are two small pockets inside and outside to keep the cables or a paper or two, but the cool feature is the airplane adapter holder that keeps it tucked safely but still reachable whenever you're on a plane. And if you're worried about the asymmetric shape of the case and whether you'll need to figure out how to fold the QC35 to fit it inside, don't. It will sit in the case just fine regardless of whether you fold the right or left earcup. You can fold either earcup to fit the QC35 in the case. Back to the QC35 themselves. Just like the unboxing, the material, finish, and design are a little understated. 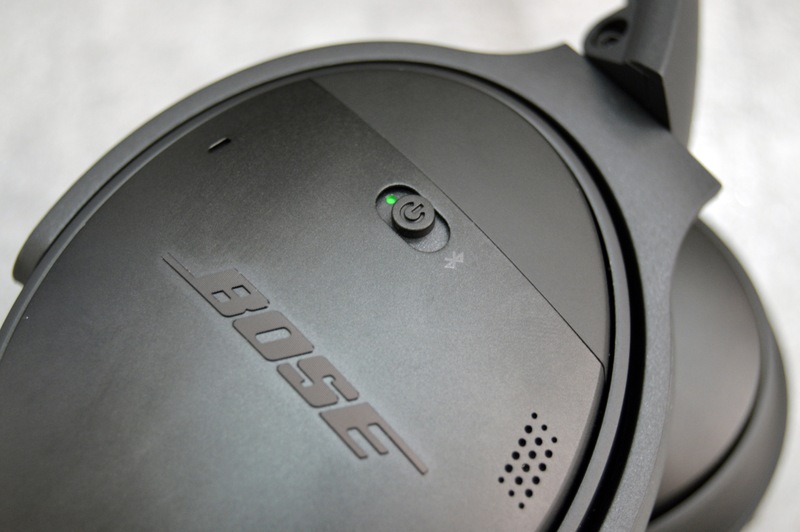 If you've seen the Bose QC25, you've practically seen the QC35. It looks almost exactly the same with its signature black plastic (there's a silver version too), but without wires and with an added Bluetooth toggle on the power switch. That's about it. The headband is extendable by about 12 steps on each side and the earcups rotate 90 degrees one way and about 5 degrees the other. They can also be folded flat to fit in the case, put on your desk, or carry in some other way. The right earcup houses most of the controls and options. 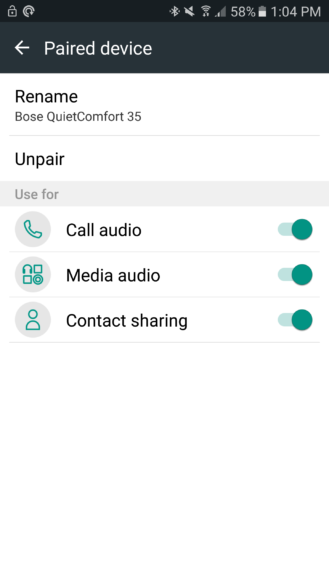 That's where you can find the three playback buttons: volume up, volume down, and play/pause which can also be used to skip (double press) or rewind (triple press), take and end calls, and trigger Google Now (long press). Next to them are the LED indicators for Bluetooth pairing and battery life. It also houses the power button, which we'll get into later, and the NFC antenna for fast connections. 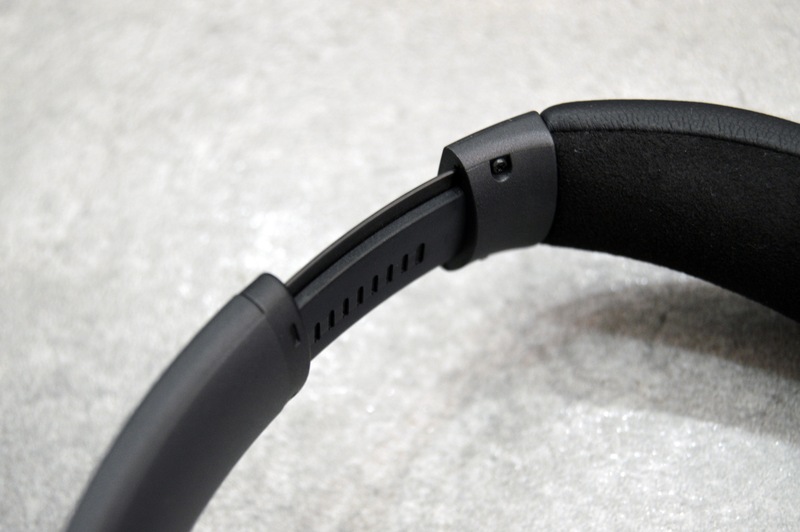 On the bottom of this same right earcup, you'll find the MicroUSB port for charging. 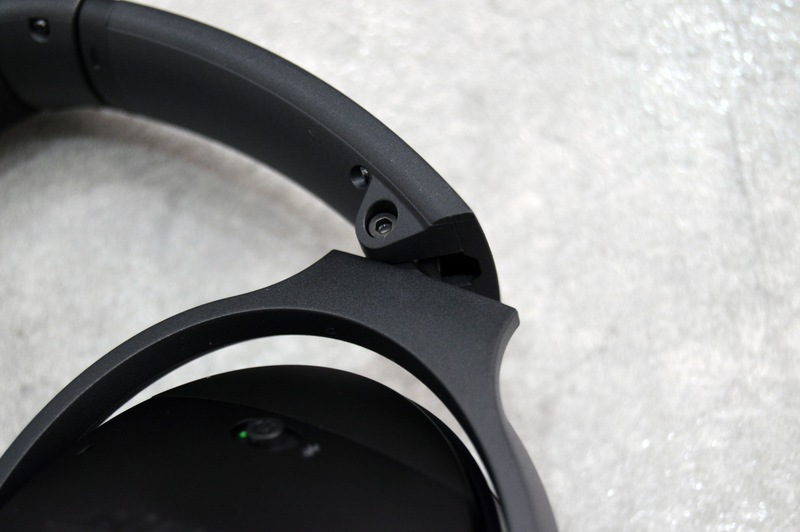 As for the left earcup, it only has the 2.5mm plug on the bottom and no other controls or ports. You may have noticed two clusters of holes on the right earcup — I don't know what these are exactly, but my best guess is some vents to keep the battery and your ear at a cool temperature. 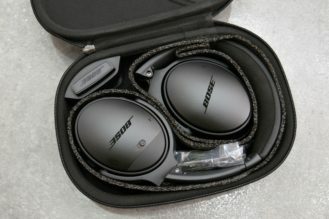 It's easy to understand why Bose didn't feel like changing much with the QC35 compared to the wired QC25. The design works very well and has garnered plenty of favorable reviews and fans over the years, and now that I've tried it, I have to agree. I like how the earcups are tilted slightly forward on the hinge, so that the headband can rest back on my head while the earcups skew forward to cover my ears. I like how the headband's suede feels against the top of my head and the lack of any pressure on my ears or head from either the band or the earcups while wearing them. I like how the earcups have a slim profile, aren't too deep, and don't push off my head a lot. 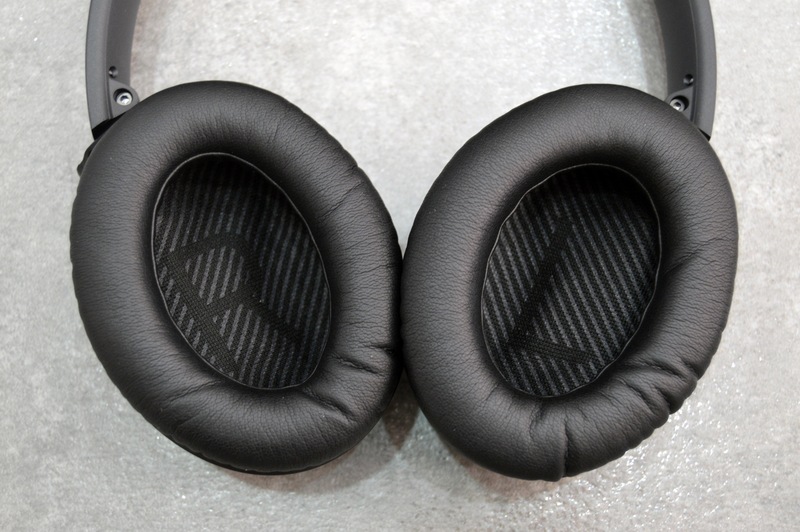 But what I love the most is their light weight, how the earcups cushion around my ears, and thanks to their oval shape how they really fit around my whole ear and not just the sides of it like over-ear headphones with fully round earcups do. The Bose QC35 is super comfortable to wear, even for someone like me that's so staunchly averse to on-ear and over-ear headphones. If I merely tolerated the Plantronics BackBeat Pro+, I honestly enjoy wearing the QC35. I have been wearing them for 4 hours while working on this review, without any discomfort. And therein lies the difference. I don't care how many options some headphones have or how groundbreaking their sound is, if I don't love wearing them, I'm neither going to seek them as often nor am I going to enjoy the experience when I do. 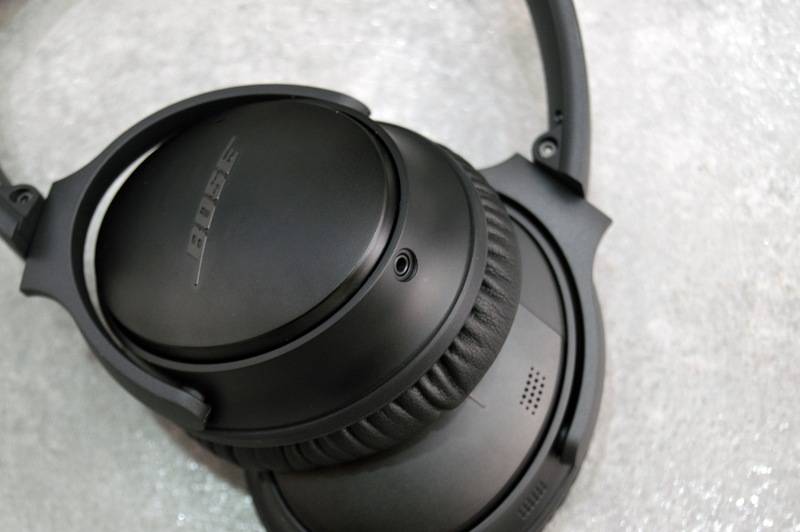 However, in use, the Bose QC35 have some ups and downs that you will quickly discover. 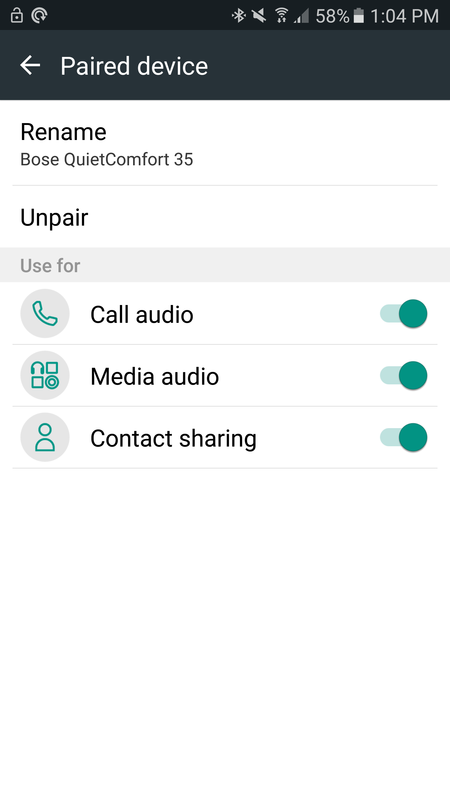 Multipoint pairing means you can connect them to two devices simultaneously, and I had no trouble taking calls from my Galaxy S7 Edge then resuming listening to music from my iMac. 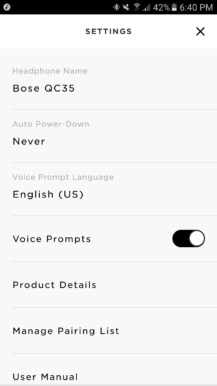 The QC35 will even tell you which devices it's connected to when it turns on. 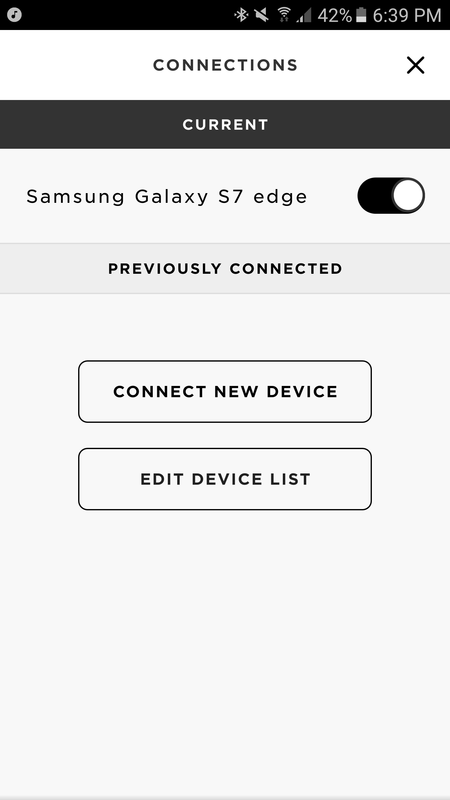 NFC pairing makes connecting to new devices on-the-fly easier. The LED battery indicator as well as battery percentage voice prompt when you turn them on give you a good indication of what to expect, longevity wise. 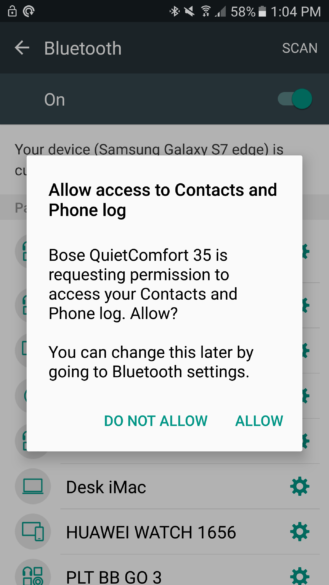 The QC35 will also ask to access your contacts to better handle incoming and outgoing calls. The QC35 are said to last 20 hours of use, but all I can confirm is they really do go on and on. I haven't had to charge them since I got them, and that's with a couple of weeks of moderate use. They'll do just fine for long flights with layovers, a weekend in the woods, or any other occasion where you need them and don't have ready access to a charging port. Their flexibility and collapsible design along with the carry case make hauling them along for rides and flights very simple too. The one major issue I have with their design is the fact that when you take them off your ears and keep them around your neck, the earcups fold upward not downward. It's very awkward and not comfortable at all, so don't expect to walk around with them around your neck when you're not listening to audio. Another weird and important quirk to keep in mind is that the controls are useless in the wired mode. They only work when you're listening over Bluetooth. When you have your 2.5mm cable plugged in, they become useless, and to add insult to injury, the cable doesn't have any inline controls like the Bose QC25's. So you either have to manage your music from your connected device or buy an adapter or a cable with controls. There are other quirks too, like the power button situation. It has an off position where you can simply listen to music with the 2.5mm cable. 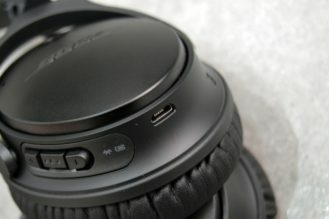 Then an on position which turns on Bluetooth and connects to known devices but also turns on Active Noise Cancellation (ANC). Then a quick release Bluetooth position that is used just to put them in pairing mode. So essentially, you can listen with a cable but without ANC (off), with a cable and with ANC (on), and via Bluetooth with ANC (on). 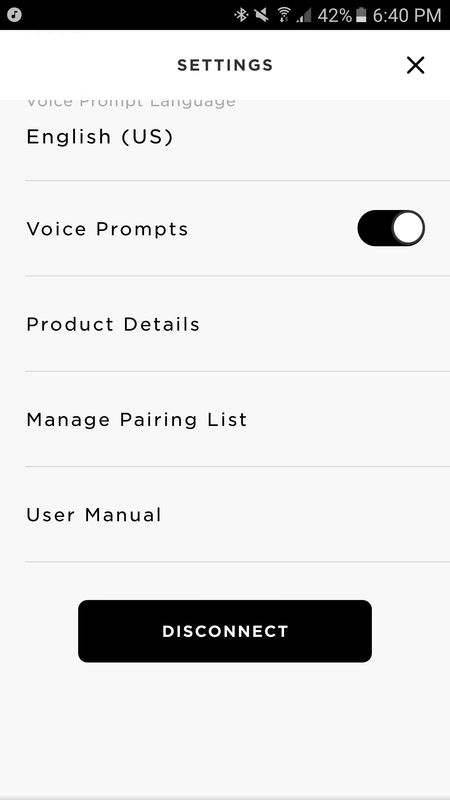 But you can't listen via Bluetooth without ANC, the button turns on both simultaneously. 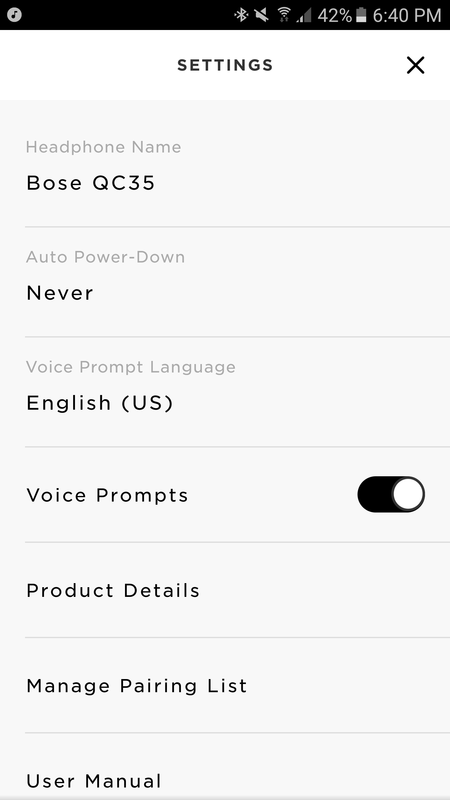 This and the lack of a transparency feature mean that whenever you want to hear what someone around you is saying, you have to pause the audio and hope that their voice will carry through, or better yet, take off the QC35 completely. I'm also perplexed by the lack of dedicated skip and rewind buttons. 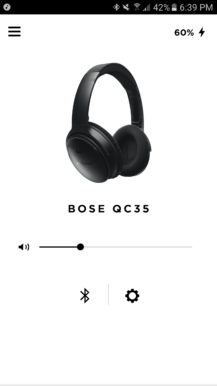 There's enough real estate on these headphones to have separate music playback and volume controls, so I'm not sure why Bose limited itself to just 3 buttons. 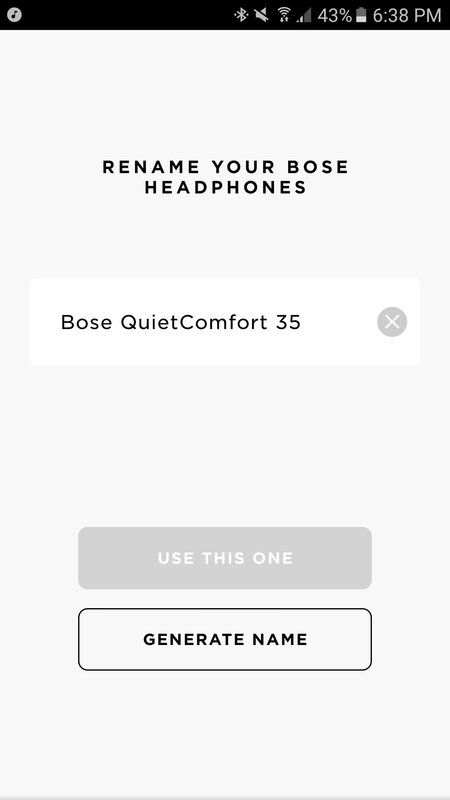 The Bose Connect app is among my favorite headphones app so far. It's well designed, although it feels more iOS-like than Android, and it has a couple of interesting features baked in. When you first open it, your headphone will be recognized and it will show the current battery percentage and volume, with shortcuts to see which Bluetooth devices are connected to it and manage its settings. You can change the QC35's Bluetooth name, remove a device off its default Bluetooth connection, and manage which two devices it will connect to when it turns on. In your headphone's settings, you can select a duration for it to power down when it's not playing music, enable or disable voice prompts (the helpful things it whispers to you), and change their language. That's also where you can see if there's a new firmware available. I got one while writing this review, it downloaded and installed just fine. 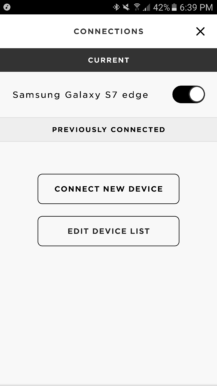 It's really nice to have a visual list of paired devices instead of guessing which last two you have connected to. That's something missing from plenty of other headphones. However, I wish the app had an equalizer or some sort of sound settings, because after all that's what headphones are for. There's a big battery and UPS system in the stock room of my pharmacy that produces a constant hum that I've gotten used to over the years. It's so loud that I can hear it even when I'm at the counter and nowhere near the back of the shop. There's also a construction site in the land facing the pharmacy, but it's at the final stages now, so although it causes a lot of noise pollution, it's nowhere near what it was a year ago. And then there are passing cars and the patients. Woops, sorry, did I say patients? 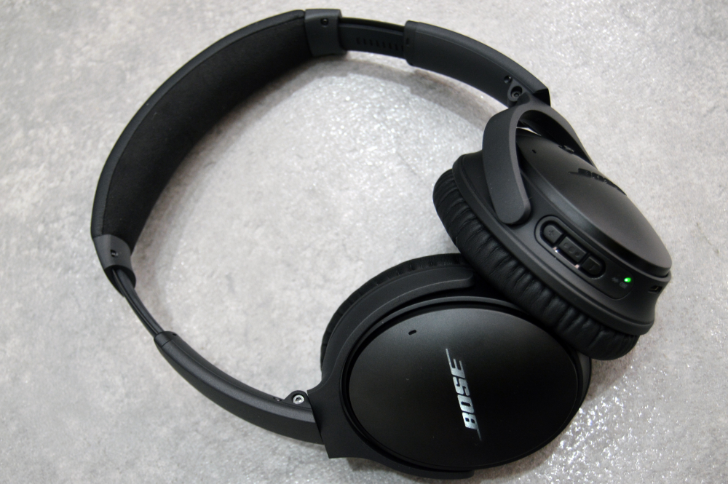 Yeah, I was wearing the Bose QC35 while working at my desk at the pharmacy and even at a medium music volume, I got so immersed I forgot about the UPS hum, the construction site, the cars, and I even missed a patient entering the store. They had to jump and wave at me at the counter to notice. I have no doubt in the Bose QC35's noise cancellation prowess. If I stand right next to the UPS and put them on, the constant hum is reduced to about 10-20% of its volume, even without any audio playing. Add some music and I can't hear a single thing. 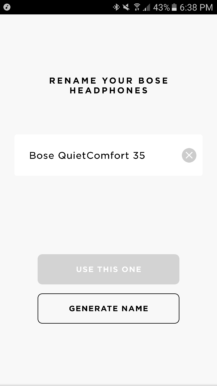 Even at low and medium volumes, the cancellation is very efficient and beats the pants off any headphones or earphones with ANC that I've ever tried. I haven't had the chance to travel with the QC35, so I can't speak to their ability to reduce engine sounds or people and children voices. All ANC headphones are better with constants sounds and don't work just as well with irregular ones. It's probably the same situation with the QC35, so don't expect any miracles for a baby's cry or shout. But for engine noise and rather steady sounds, the QC35 should do just fine. Bose's headphones are often very divisive when it comes to sound and the QC35 are no exception. Some will tell you that Bose has a reputation in the business of favoring mids over highs and lows, others will say that the sound is represented faithfully without any flourishes, with easily distinguishable frequencies and none overpowering the others. My experience with the QC35 has been somewhere in the middle of that. The sound is flatter than I'd like and has less character than some other headphones I've tried. 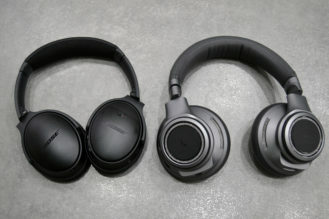 Even the tiny Plantronics BackBeat GO 3 seem to be better at providing a richer sound sometimes. Bass is more subdued than what is currently the trend. The beats are well differentiated though, unlike other headphones that just don't know how to handle bass. However, depending on your personal preference, you'll either find them at the perfect level or just average. I'm not a huge bass lover, I don't need my skull to vibrate to enjoy the music, so I was quite happy with the performance on songs like Lorde's Royals or Sam Hunt's Breakup in a small town. On Kendji Girac's Andalouse the vibration following the beats was more differentiated than I've ever heard it before, enough that I can almost hear each part of it distinctly on the QC35. At higher than 60-70% volume though, I kept feeling that the bass wasn't as clean as I would have wanted. If you are not much of an audiophile, you may not notice the flatter profile of the QC35 unless you look for it, or you may notice it but then get used to it fairly quickly like I did. For those a little more demanding with audio, equalizers can help a bit with the issue. 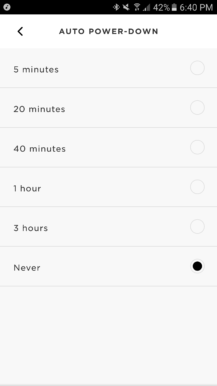 Keep in mind though that if you enjoy different types of music, you'll end up spending a lot of time on the equalizer settings screen of your music player of choice or you'll choose to constrain yourself to a certain genre for a while to keep the same profile. Oh and if you're the kind who likes to listen to podcasts too, you'll love the QC35. They're perfect for speech and you'll be able to hear even the smallest background noises on podcasts recorded with average mics. At $349, you had better figure out what the competition field is like before you buy the Bose QC35. 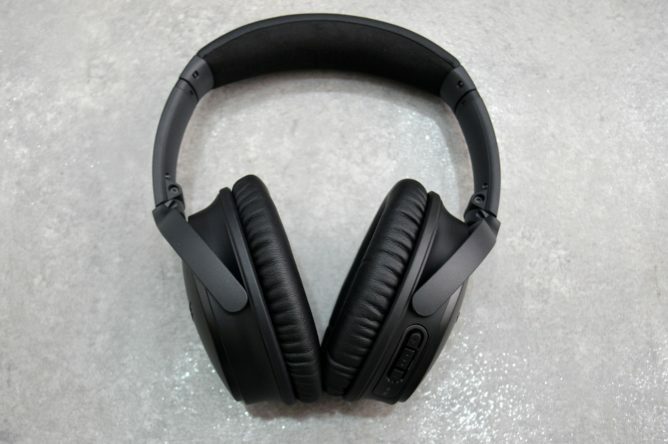 I can't speak of every Bluetooth headphones with Active Noise Cancellation out there, but I do have the Plantronics BackBeat Pro+ ($299 MSRP, $260 recently on Amazon). The BackBeat have a couple of features that the QC35 don't: a handy sensor that automatically pauses and resumes music when you take them off and put them back on, an Open Mic mode to hear the world around you even with the headphones on, a slightly longer battery life, separate playback controls and volume keys, and a USB adapter to connect to any computer without pairing. They feel more expensive thanks to their mix of silver accents, but I don't have any build quality issues with the QC35 either. However, the BackBeat are also bigger, heavier, and a lot more cumbersome. They don't fold the way the QC35 do and they only come with a storage pouch, not a carry case. 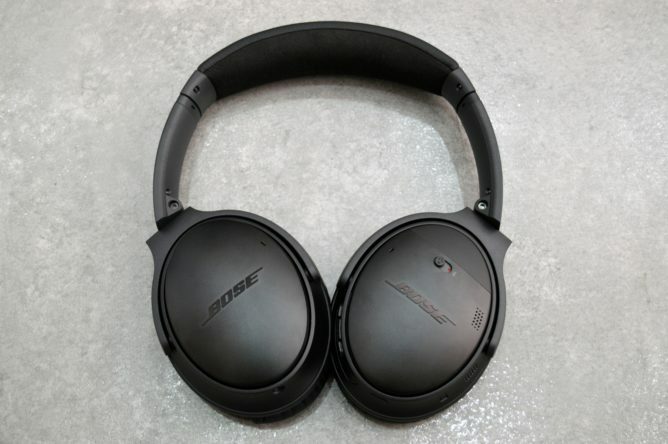 While the BackBeat Pro+ do offer a more bassy sound with a bit more power and character, their noise cancellation pales in front of the Bose QC35. That UPS machine sound I talked about? I can still hear about 50% of it with the BackBeat without any music, but the QC35 left nothing more than 10-20% of the noise. And then there's the matter of comfort. 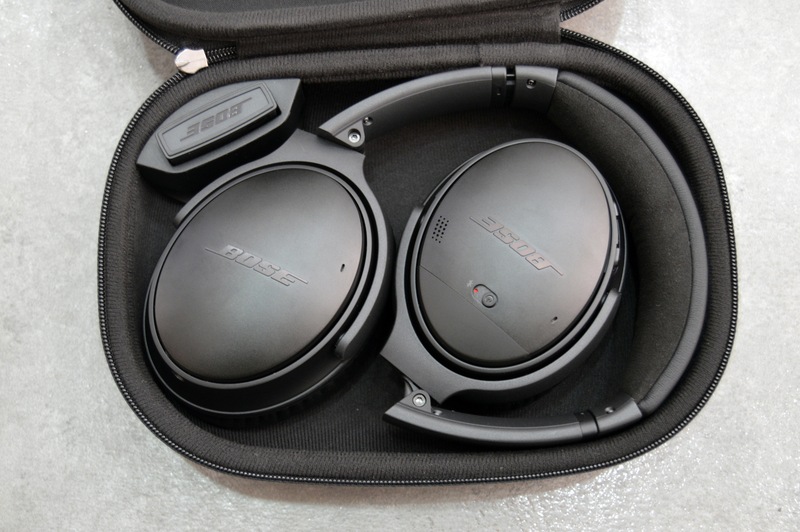 As I said at the beginning, the Bose QC35 are pleasant to wear, even for long hours, don't exert pressure on the ears or head, and their light weight and small profile make them more enjoyable over longer listening sessions. 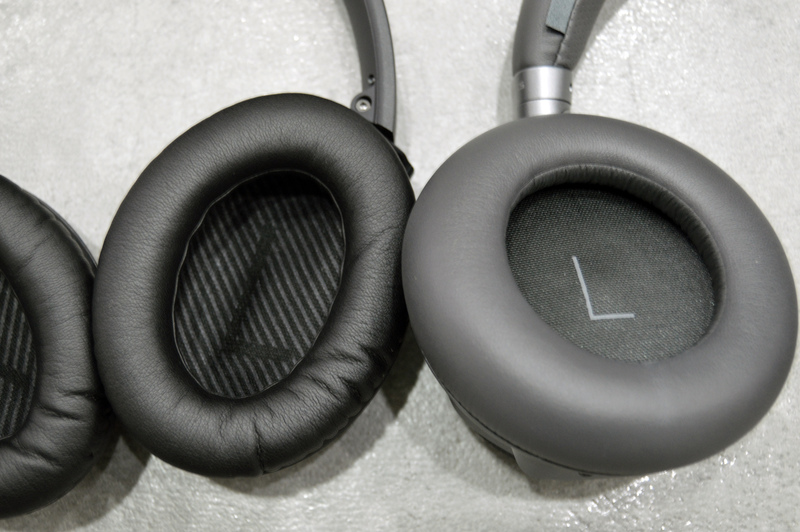 The oval earcups on the QC35 compared to the BackBeat Pro+'s round ones might play a role in how well they fit around the ears too. 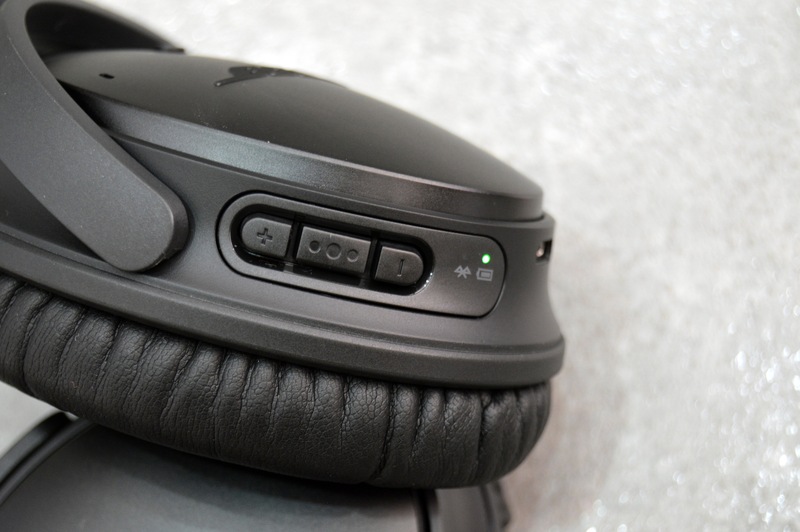 Basically, the way I see it, the BackBeat Pro+ would be more perfect for you if you're planning on using it around the house or office, while playing video games or working. 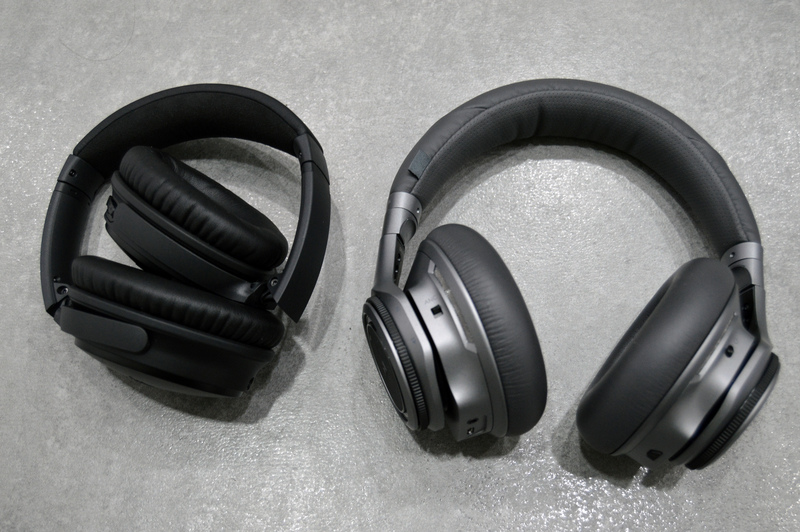 Even better, you can get the cheaper regular Plantronics BackBeat Pro ($160 on Amazon) without the USB and you'd have the same features for much less. But, if you want something compact and portable to carry around or if you heavily value comfort and lightweight headphones, the Bose QC35 simply blow it out of the water. There are a few other headphones that I'd recommend you consider. The V-Moda Crossfade Wireless ($300 on Amazon) offer a more bassy and rich sound, a similarly compact and lightweight body, but have less bells and whistles, and no active noise cancellation at all. 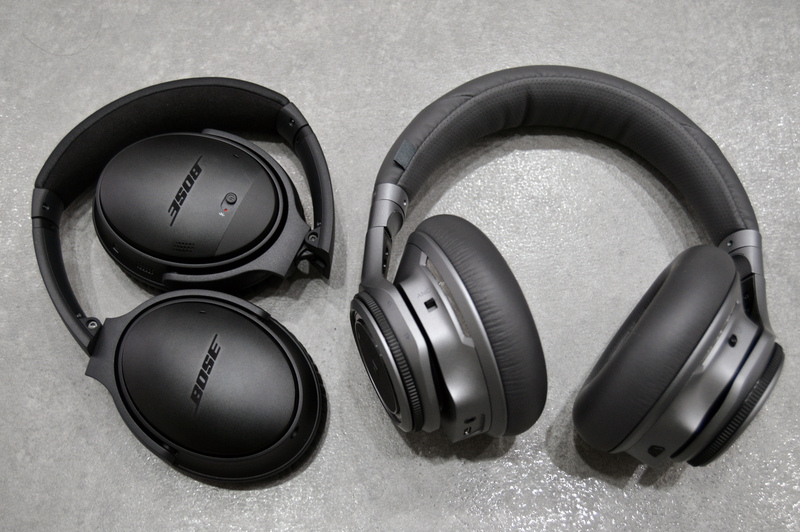 The Bose QuietComfort 25 ($299 on Amazon) have the same look as the QC35, the same noise cancellation prowess, but are wired so you can save $50 if you don't need Bluetooth. The Sennheiser Momentum 2.0 ($499 MSRP, sometimes found as low as $380 on Amazon though) seem to be the gold standard with very good noise cancellation but also excellent sound profile. 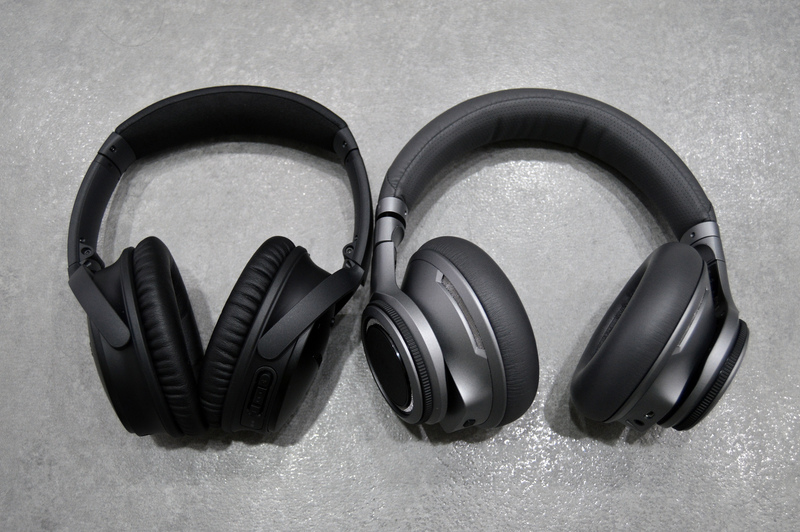 And finally, the recently released Sennheiser PXC 550 ($399 on Amazon) seem to tick the exact same boxes as the Bose QC35 on paper, but are less polarizing when it comes to sound quality. It's hard to find any reason not to recommend the Bose QuietComfort 35 after having fallen in love with them this much. Their size, weight, shape, and fit are just perfect for me so they're the first headphones (over-ear, on-ear, open-ear, whatever category you want to consider) that I can wear for more than 10 minutes without any pressure building up around my ears and in my head. 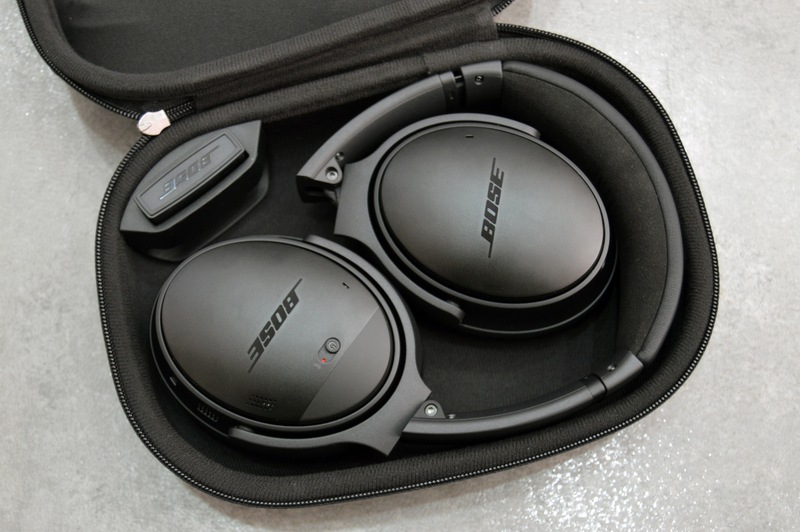 Their compact and foldable shape makes them great for travel and storage, but it's their active noise cancellation that shines the most. Hums and consistent noises are near obliterated by the QC35 even with no music on, so adding some tunes just makes them completely disappear. And if you're anything like me and you are not super picky about a specific sound profile or frequency, you'll love hearing most of your music with them. You might wish for a bit more character in some songs, a little heavier bass here and there, but overall, the clarity of the music on all frequencies will win you over. But I can understand why, for some, there's a bigger question mark regarding the Bose QC35. The flatter sound, the lack of controls when used in wired mode, the fact that you can't use Bluetooth without ANC, and a few other quirks here and there, might make you want to look elsewhere. For me, these aren't deal-breakers. As long as I can actually put these headphones on and listen to music for a couple of hours without any discomfort or disturbances, I'm golden.